Does your bedroom need to be bolder and your living room livelier? If so, consider brightening an unloved corner with a beautiful statement chair. It’s a fab way to freshen up a room without having to do a complete décor overhaul. Let’s be honest, who can cope with the mess and time it takes?! The perfect statement chair can transform a space and add a real finishing touch. Especially when accessorized with a cute cushion or a stylish side table. As well as being an interior must-have, accent chairs are practical too. The extra seating for entertaining guests always comes in handy. With a statement chair it’s good to consider the room that you’re buying for. If you’re not blessed with space a cute little cocktail chair works a dream. They instantly add vibrancy and character to a dreary corner. Check out our cute as a button Ava cocktail chair which is available in cerise pink, electric blue and storm grey. Wrapped in soft velvet and featuring brass capped legs, they add a sprinkle of glamour to any space. This little number really is a head-turner and was even used at the FOX Golden Globes After Party in Beverly Hills! That’ll certainly have your guests drooling with interior envy. A wingback chair could be a better choice if you’re looking to add an air of sophistication and grandeur. It’s also a fabulous way to add some height to your room. We’ve updated our wingback chairs with a selection of gorgeous velvets in several colours. For instance, the Wilton wingback is available in a deep emerald green or a rich sapphire blue and bordered with brass studs. As well as being rather scrumptious to look at, they’re surprisingly very versatile. They add a splash of colour to neutral tones but we’ve seen them illuminate bold interiors and it looks stunning. Playing with different colour contrasts can also instantly revitalize a room. I’ll be the first to admit that our living room was only decorated a year ago and I’d already started to get RRF (restless redecorating fingers – we’re sure this is a thing!). I decided to set myself a budget and accessorize with some updated colour combos. Working with deep petrol blue walls and dark wooden furniture I wanted to add some light and inject a little more colour. Luckily our Manhattan accent chair in natural was a perfect fit for this. It really pings against the vibrant walls. I teamed the chair with our rose pink metallic cushion (the pink on blue is a fabulous combo) and placed our pink candle holders on the mantelpiece nearby. It’s really updated a disused corner and the natural tones and pink hues help to lighten the room. So big, small, bold or neutral, whatever your space there’s a statement chair that’s just perfect for you! The inspiration for this chair came when we decided to combine our love for traditional, grand chair designs with a modern finish. We picked a tried and tested wingback for its comfort and sophisticated feel and wrapped it in a soft velvet fabric. We chose a deep emerald green (The Wilton is also available in a rich sapphire blue) to create the ultimate statement chair. The finishing design feature was to add individual hand-studded brass nailheads. It’s fair to say that The Wilton certainly won’t wilt in the corner! This chair is perfect when it comes to accentuating on trend materials like gold, brass and marble trinkets in your home. It’s very plush indeed. We adore The Wilton so we thought it only fair to give it its turn in the interior world’s spotlight. 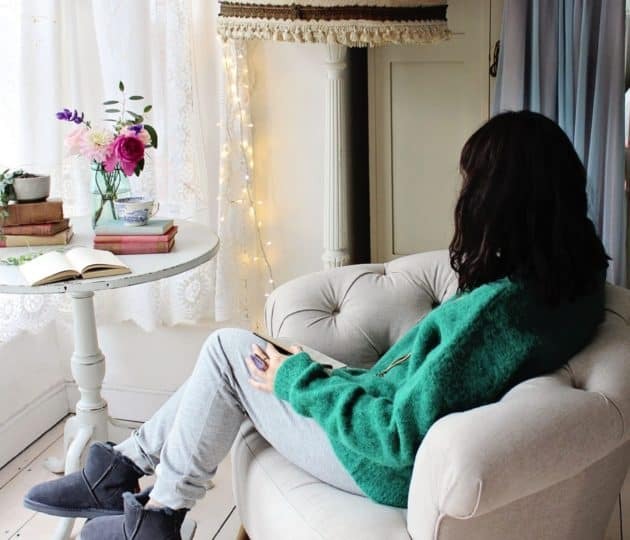 There are so many ways to style this chair and we teamed up with Jess, award winning lifestyle blogger and owner of The Only Girl in the House, to see what her take was on this velvet dream. And we were so glad we did because we love what she’s done with it! Jess writes about how her lounge was feeling a little unloved and abandoned from an interior design point of view. She wanted to create a beautiful corner designated to quiet, chill time. And The Wilton is the perfect accent chair for that! She particularly loves the rich jewel green tone and soft velvet which adds warmth to her lounge. 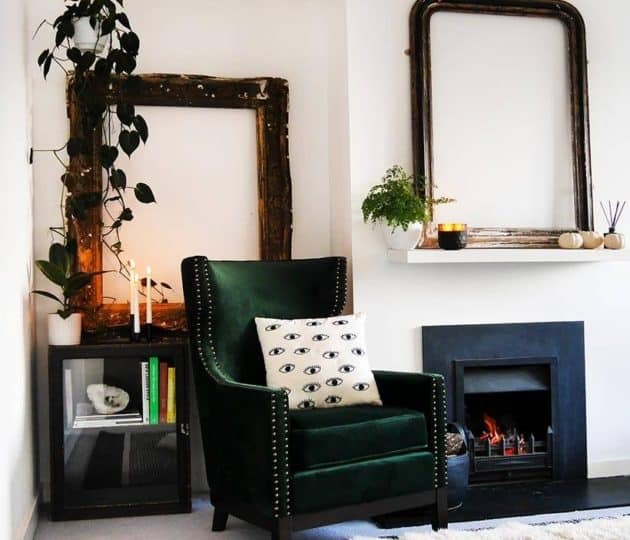 The brass studs create the perfect boho look along with a chunky mirror, an eclectic eye design cushion and a cosy sheepskin rug. Jess has some brilliant photos to show off this chair, take a peek here. View our Wilton in green also available in blue. The Eversley is a chair that sings out to be sat on. The button back detail is well cushioned and the arms seem to elegantly spill over. The one word we always use to describe this armchair is plump. We have the Eversley natural sat beautifully in our guest bedroom. The oatmeal colour really pings against the subtle feather flock grey walls. It’s a very versatile chair when it comes to pairing it with other homeware items. But as we’re slightly obsessed with interior design and seeing our chairs placed in as many settings as possible, we reached out to blogger Alice, author of More Than Toast. Her lifestyle blog delves into life as a Mum, the latest fashion trends and homeware must-haves. Alice also has a column in The Telegraph and was interviewed by Jane Garvey on BBC Radio 4’s Women’s Hour. Alice decided to style the Eversley armchair in grey to create a snug reading corner. A place where she could sit and work or just enjoy a nice mug of tea. 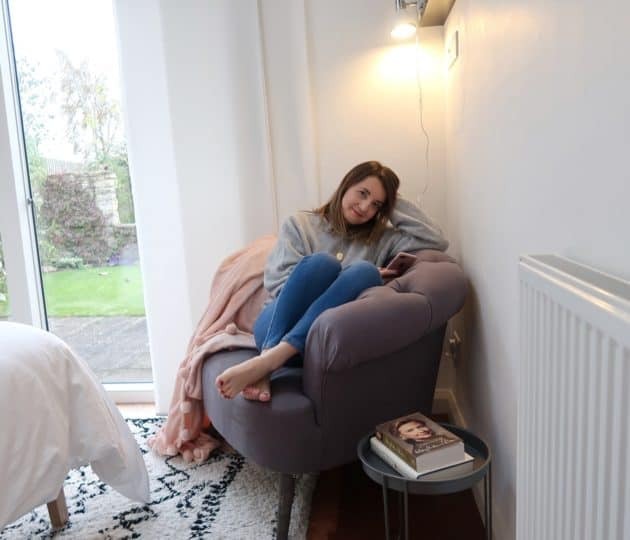 To complete the look Alice included a cosy blanket, a small metal side table and a lamp (all available from Wayfair UK). For some interior inspiration, read the full story here. 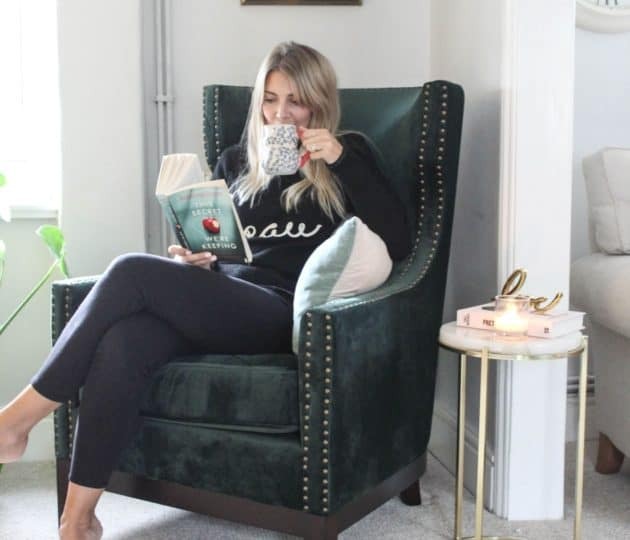 To show The Eversley armchair in a different light we teamed up with Tamsyn, an interior stylist, photographer and author of The Villa on Mount Pleasant. 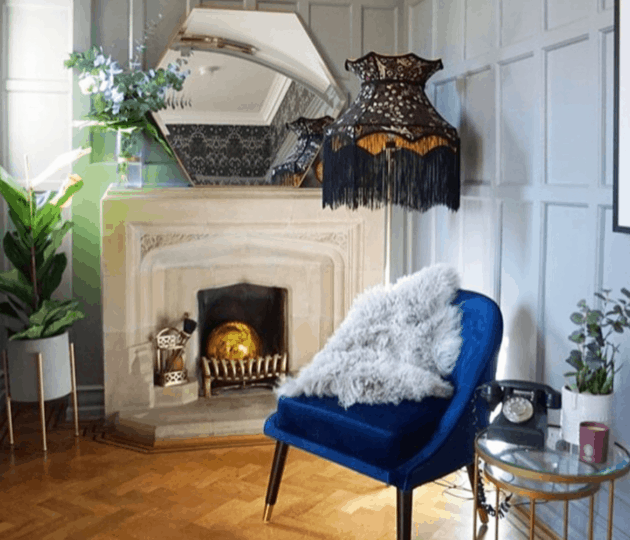 In collaboration with online furniture retailer Wayfair UK, Tamsyn was set the interior styling challenge of creating a cosy reading nook, perfect for cooler months. The Eversley armchair was the centre piece, after all, what’s the ideal reading corner without the perfect snuggle chair? Tamsyn paired our armchair with a vintage side table and shabby chic lamp. The natural oatmeal linen fabric and button back detail work fabulously in this setting. And not only is this chair a design dream but it is the epitome of comfort. There’s only one word to describe the Eversley; plump…plus we like saying that word. Get the full style idea here and view The Eversley here. Photo credit Tamsyn from The Villa on Mount Pleasant. The best part of our job is seeing one of our chairs showcased in someone’s home. We love to see how that individual has styled the chair and what other homeware and decor they have mixed and matched it with. It’s amazing to see each person’s perspective and when it comes to interior design, everyone has a completely different style. To get a different look for our elegant Davenport armchair, we worked with Victoria, owner of Apartment Number 4, a multi-award-winning interior design and lifestyle blog. Victoria describes how she took a disused corner by her balcony and turned it into the perfect reading spot. She paired the Davenport with a chunky knitted throw (for chillier months), a crushed velvet cushion, a mirrored side table and of course a reading lamp. We absolutely love how Victoria has styled this chair and the hues of blue and grey really accentuate the oatmeal colour. You can read the full article here. Take a peek at our Davenport chair. Photo credit Victoria from Apartment Number 4. We wanted to show off our new green dream The Wilton wingback chair. To get a fresh perspective on this velvet treat, we decided to team up with Cara, the author of Within These Walls lifestyle blog (nominated for UKBlog awards 2018) and online furniture store Wayfair UK and Homesense. Cara was set the interior style challenge of introducing a bold colour into her living room to create the perfect cosy reading corner. 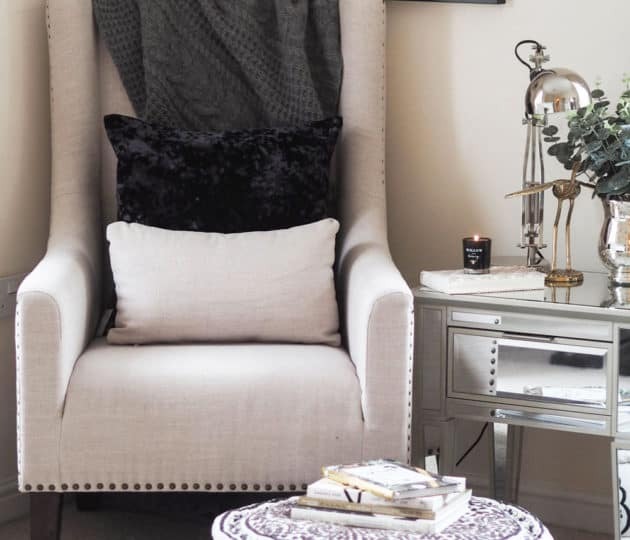 Using our jade green, velvet wingback chair and some additional accent pieces from Wayfair and Homesense, Cara created a dedicated space to relax and unwind. She mentions that introducing a rich colour onto a backdrop of soft greys really does transform her living room and bring it all together. Have a look at our Wilton wingback chair here. Also available in a rich blue velvet. Photo credit Cara at Within These Walls.